Vainglory, showcased as one of the examples of the capabilities of the iPhone 6 back in September, is now available for download. Developer Super Evil Megacorp announced today that the game can be downloaded on the App Store in North America, South America, the Middle East, and Africa, with a European launch coming this Thursday. Japan, China, and Korea are promised to closely follow. The game actually launched unexpectedly early, with some users able to download the app yesterday afternoon. Vainglory is a MOBA (Massively Online Battle Arena) that puts players in teams of three, each team fighting to destroy a crystal at the opponent's home base in "fast-paced, 20 minute online multiplayer matches." Mobile MOBAs are nothing new, with games like Fates Forever and a handful of others finding success in taking the PC-centric sub-genre and grafting it onto a mobile phone touchscreen. The game is free-to-play, with certain characters available to everyone at specific time intervals. Users can use in-game cash accrued through gameplay to unlock new classes, or opt to pay real-world money for those classes if impatient. Notably, however, users can't use real money to purchase character perks and upgrades or one-time-use in-game bonuses. Vainglory's biggest advantage is its positioning as the killer app of the moment for Apple's newest iPhone, much like Infinity Blade III was for the iPhone 5s and even the original Infinity Blade was for the iPhone 4. Though it's touted for the iPhone 6 and 6 Plus, the game can be played on the iPhone 5s as well. iPad options include the iPad Air, iPad mini with Retina Display, iPad with Retina Display, and iPad Air 2. 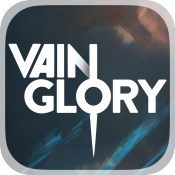 Vainglory is available to download for free on the App Store for the iPhone [Direct Link] and iPad [Direct Link]. I'm excited to play the game. I love DOTA, hopefully this will give me the same experience on my iPhone. It won't. I tried a few matches, it's okay, but nothing spectacular. I play LoL and DOTA and obviously we're dealing with 2 different platforms here, but there doesn't seem to be much of a challenge. Hero's of Order and Chaos is better than this even if it's graphics aren't quite to this scale. Its a good game when people dont leave mid match. Is it just me? I had this game for a few days now- and I'm in Europe. I played some last night. It's decent... but not awesome. I'm 100% confused about why they put the abilities on the _bottom_ of the screen! I was playing on my iPad in bed and it's natural for me to use my thumbs... but the abilities are really far away from either thumb. They really want you to lay it down and use two hands. If they would have put the abilities on the left or right (or let you choose) then it would be come a lot more "thumbable"
Also... I got pretty annoyed at the view being locked to your character (unless you touch the map... but then the view springs right back to your character as soon as you lift a finger). From playing LoL I'm pretty used to moving my view down the lane and clicking on a tower down the lane to send my guy to while I go look at what's happening elsewhere in the world while he walks. You _can_ actually do that in this game... but you have to use two hands (again). With one hand/finger touch the map then with the other hand/finger touch where you want your guy to walk... it's kinda wonky and the view springs around a lot... but it is doable. Also... if they were going to lock the view to your character then let me "touch and hold" to make him walk in a direction. That way I can just "hold" on the left or right side of the screen to make him walk down the lane. As it is now you have to click your way all the way down the lane (unless you use the trick I outlined above). Basically: They claim that the game is "Perfected for Touch"... but I found it to be almost the opposite. I don't see anything that they did here that is a unique take on MOBA on mobile. However: The graphics are great - and the gameplay is really smooth. The abilities seem to be well thought out and flow together well. I do like the way the Store is laid out and it was easy to just jump into a game... so I probably will play it some more.